Corporate Sponsors Needed for Team Katie! Here’s a PDF copy of this letter Please spread the word! 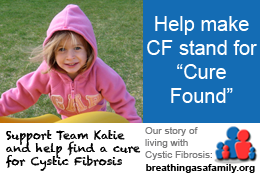 As you may know, our daughter Katie Dow is a 4 year old Beamsville resident with Cystic Fibrosis. Team Katie is the group of family, friends and co-workers that are rallying around Katie to help find a cure to for Cystic Fibrosis and we are looking for corporate donations for the 2011 Great Strides Walk. Please consider sponsoring Team Katie in the 2011 Great Strides walk, which will be held on May 29 2011 at Safari Niagara in Stevensville. Note: 100% of the proceeds from all cash and/or donations will go directly to Cystic Fibrosis Canada via Team Katie as part of our 2011 Great Strides fundraising. Team Katie communicates directly with over 500 individuals, many of whom are located in the Niagara region. This includes family, friends, co-workers and other supporters of Team Katie. This group of people is passionate about this cause and they are acutely aware of (and supportive of) the help that is provided by other Team Katie sponsors, including you! Team Katie email distribution list = 250+ supporters, almost all of whom are located within Niagara. If you are interested in donating $7,500 or more, please contact me directly. I’ll find a creative way to make that size of a donation worth your while (all of the above, plus web marketing consulting, website design, etc.) Trust me, it will be money well spent! Should bad genes = no more kids? Great Strides 2016 – the walk is this weekend! Great Strides 2015 – the walk is this weekend! Great Strides 2014 – the walk is this weekend!